Quality, reliability, ease of use and feature rich are attributes that are consistent across the entire range of Haes fire alarm control panels. As the entry level panel from Haes, the Eclipse encompasses all of these attributes to provide a panel that meets a variety of needs. For the fire alarm engineer the Eclipse has been designed to minimise labour costs. There is ample room for wiring, changing batteries and clear indication. Activation is via key switch or access code, which means you should always be able to work on the panel and the one man walk tests will help reduce the cost of maintaining the fire alarm system. The Eclipse is the only entry level panel on the market that will reduce false alarms. The Eclipse can be programmed so that it requires a secondary confirmation before sending the panel into alarm. 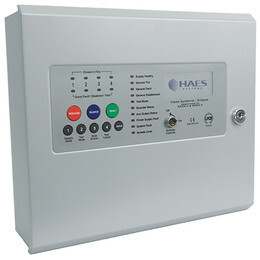 Fire and Rescue services are looking to this type of functionality to allow them to respond to Alarm Receiving Centres. Two or four fire zone circuits are provided plus two monitored sounder circuits. Fire & Fault VFCO relays, Fire & Fault switched negative outputs, class change and an alert input are also included. The fire zone outputs can be set as ‘Twin Wire’ by DIL switch selection. In ‘Twin Wire’ configuration, special detector bases and call points must be used. Eclipse panels are approved to European standards EN54-2 & 4, Fire Detection and Alarm Systems – Control & Indicating Equipment. Haes panels support an extensive range of conventional fire detectors, including Apollo, Hochiki & Nittan. Twin Wire mode requires special, ‘Sav-Wire’ detector bases and polarised, 470Ω call points. False alarm mode requires a 220Ω ‘Evacuate’ call point for EN54 compliance.